As new homes keep getting larger and larger, so too has the trend toward designing new garages to accommodate more (and bigger) vehicles and a host of storage needs. Garage design has started receiving more attention than it used to. It's been a long time since we saw a newer housing development that didn't have garages attached to all of the houses. Attached garages offer a lot of convenience, especially in cold, wet weather, but they also severely limit the design options for the house and garage. If you are planning to build a garage, take some time to consider the benefits of separating the garage from the house. In new home construction in recent years, the standard house plan has a big garage facing the street, attached to the side of the house, with entry to the house requiring a tour of the laundry or utility room, often passing a small bathroom on the way. That nice entry out front gets very little day-to-day use. For a variety of reasons, this layout saves money. But is cutting costs in the primary entrance really a smart choice to make? A nicely designed mudroom, with good storage and a place to sit is certainly more welcoming and useful. In 1971, 18 percent of new homes in the United States had a one-car garage; 39 percent of them had garages big enough for two or more cars. By 2007, those numbers had been stood on their heads: 63 percent of new homes had two-car garages, 19 percent had garages for three or more cars, and only 7 percent had a one-car garage. The two-car garage has become the minimal standard, and it needs to be large enough for SUVs, minivans, and large pickups. Three- and four-car garages are increasingly popular in high-end developments, and many real estate agents will tell you that they can be a positive selling point. Rather than having your garage face the street, try to adjust the footprint so that the garage entrance is angled away from the street. 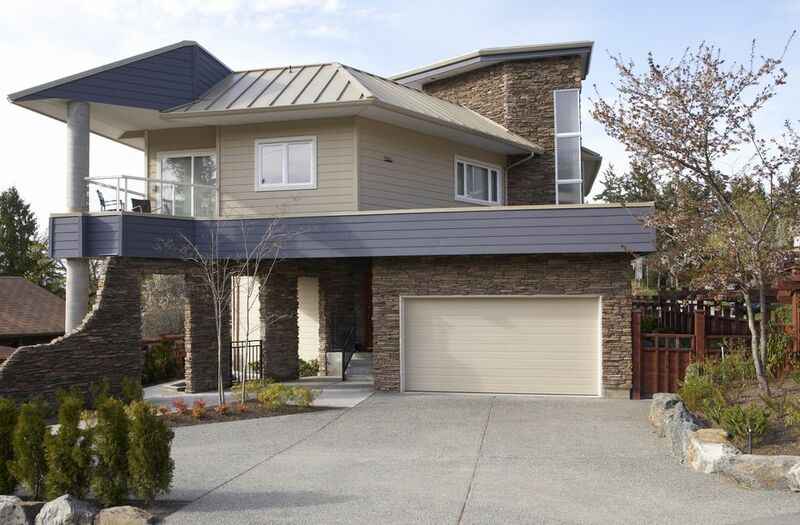 A 90-degree offset from the house is ideal, but even 45 degrees can significantly reduce the impact the garage entrance has on the street view of the house. It’s not too difficult to design a simple garage that can be attached to a house without looking overly dominant. But it can be a challenge to create living space above the garage. Because of the combined wall heights of the garage and a full-size space above it, the roofline may need to be higher than that of the house. Living space over a garage can be the most economical way you have to create a new home office, media room or rental space. But you may find that this can be achieved more easily with a detached garage. If you want to add living space over an attached garage, try to keep the distance between the garage ceiling and the top of the door closer to 12 inches than the typical 18 inches. Some of the nicest garages I’ve seen don’t look like garages. Instead, they look like part of the house itself. Think about ways in which you can give your garage a house-like facade. Match any siding, windows, entry doors and trim with what's on the house. Break up the bulky appearance of a single garage door with two or more smaller doors. You will need stairs to get to get to the upper level. If you want them to be inside the garage, place them along one side and then create a work or storage area of equal size on the other side of the garage to create balance in the facade. Note that if the upper level will be used as a bedroom or a rental unit, you will probably be required to have an outdoor stair for egress. Check with your local building inspector. If you live in snow country, keep in mind that you will want to leave room for snow removal. This is especially important if you use a plow to remove the snow. If your garage is located at the end of a driveway, it can be very hard to plow it cleanly.